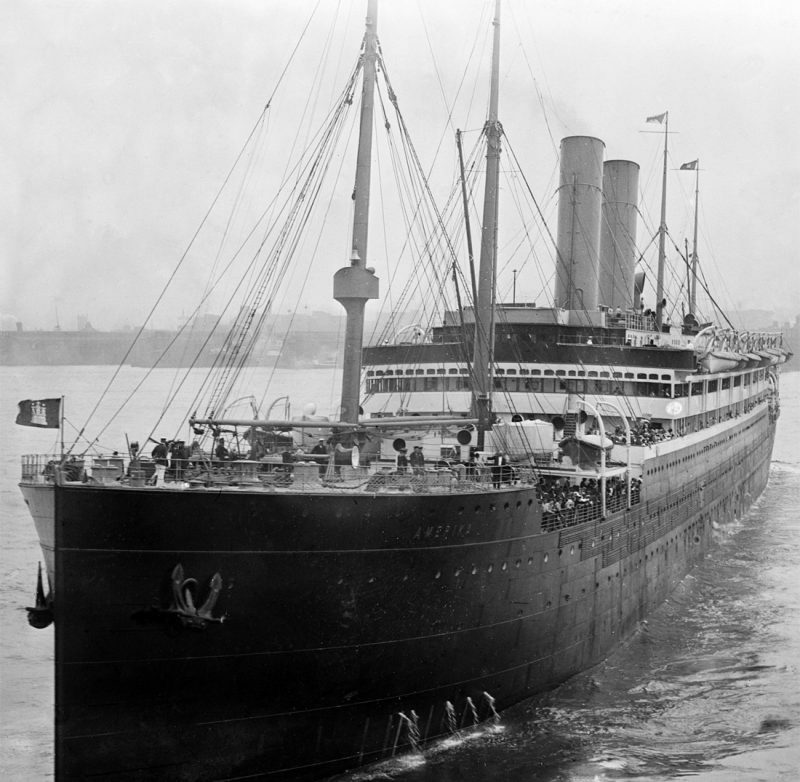 The Amerika was one of the largest ships in the world in the early 20th century. 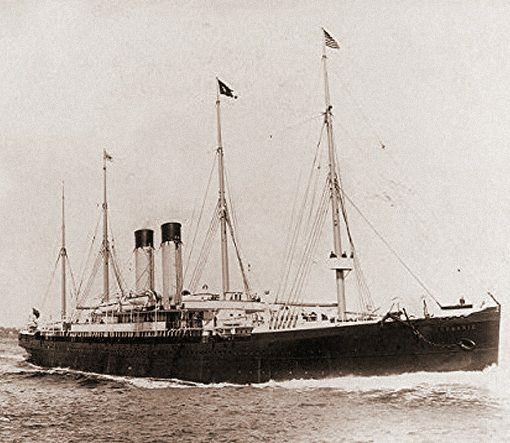 Profile view of the Amerika in HAPAG livery. The popular Ritz-Carlton Restaurant on board the Amerika. 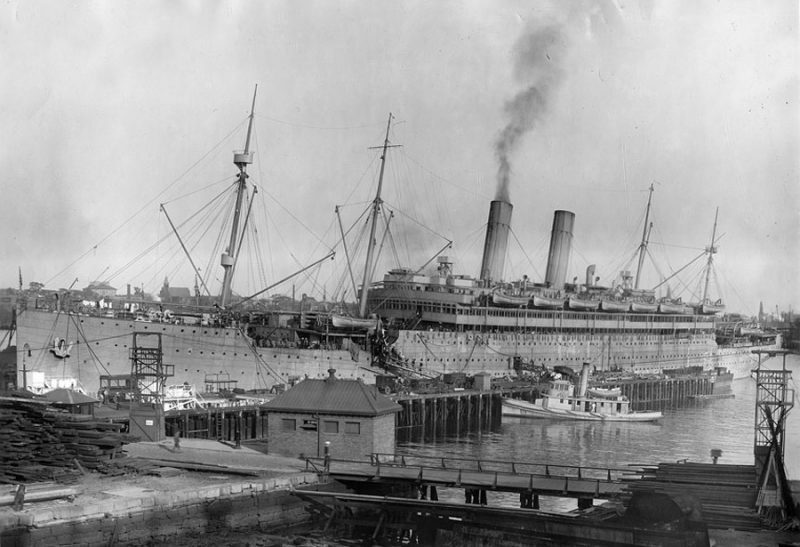 In US custody and renamed America, the ship was painted grey for her duties as a troopship. The troopship America, seen here in dazzle camouflage paint. The America being salvaged, after having sunk at her Hoboken pier. 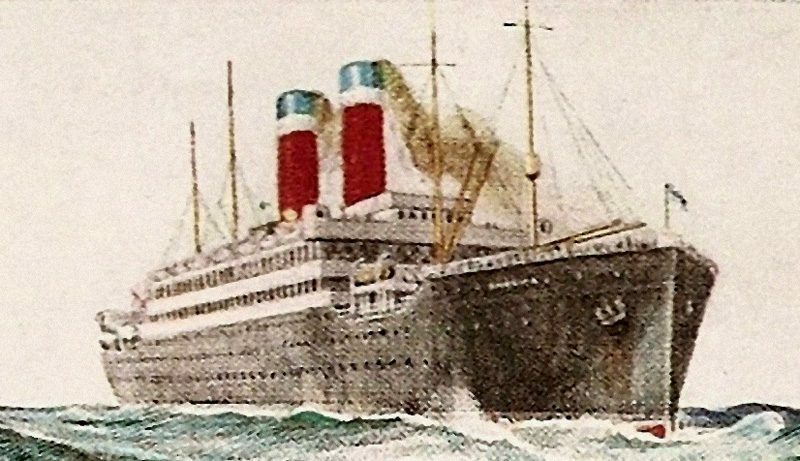 Colour advertisment of the America, sporting the red, white and blue funnels of the United States Lines. The former Amerika as the Edmund B. Alexander. Her new name seems to have been painted onto her bow. The Edmund B. Alexander as a repatriation ship following the end of World War II. A large banner in the background welcomes the returning troops home. 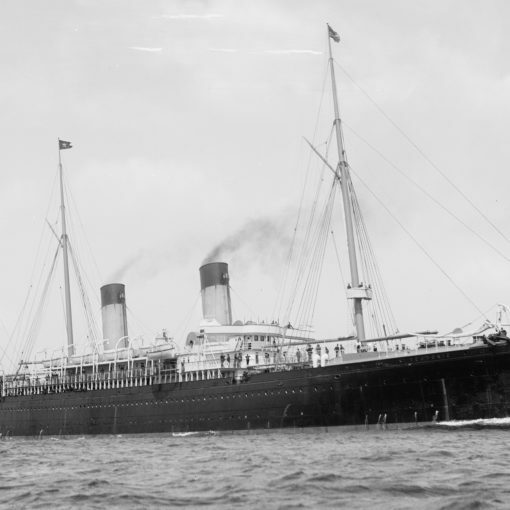 After the immense success with Norddeutscher Lloyd’s fast liner quartet starting with the Kaiser Wilhelm der Grosse of 1897, the second major shipping company in Germany – the Hamburg Amerika Linie, or HAPAG – tried to match this first ship with a marvel of their own. This resulted in the 16,000-ton Deutschland who arrived in 1900. As time would show, she would have the power to wrestle the Blue Riband out of Norddeutscher Lloyd’s clutches. But this was at a very high cost. The speed of the vessel made her vibrate so much that several places in her accommodations was looked upon as uninhabitable. These problems were never fully remedied, and the Deutschland became somewhat of a failure for HAPAG. Dr. Albert Ballin, who was the director of HAPAG, now began to think in different terms. 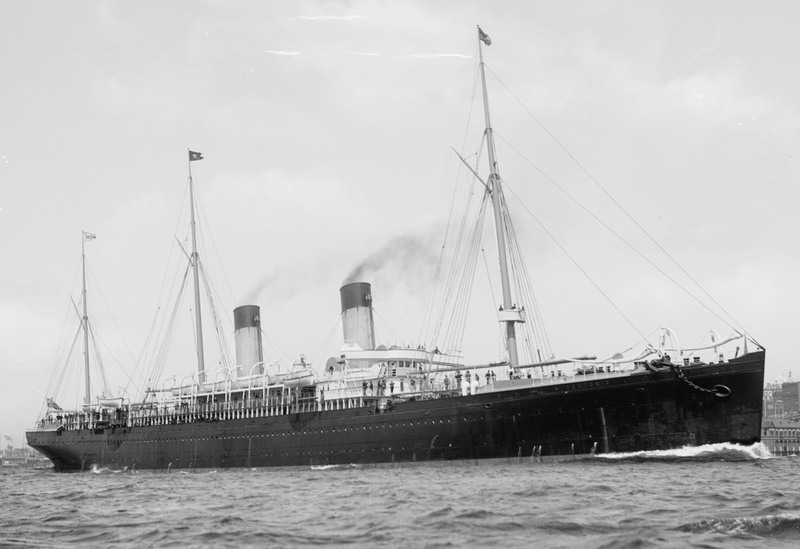 He decided that the Blue Riband would not be in the company’s interest anymore, but HAPAG would still outmatch Norddeutscher Lloyd – or any shipping company in the world for that matter – in the terms of size and luxury. He had taken the same decision Bruce Ismay of the British White Star Line had taken a few years earlier when deciding upon the Celtic-class against the Cunard Line’s ever-accelerating vessels. Now, a new liner would give HAPAG the honour of being the most prestigious shipping line in the world. The new liner would be constructed at the Belfast-based shipyard Harland & Wolff. An exception had to be made, since Harland & Wolff had signed an agreement with the White Star Line not to construct ships for any rivalling shipping company. This might be tied together with a rather unlikely story that the hull of the later White Star liner Adriatic was sold during construction to HAPAG, who turned it into their new flagship. The Adriatic was started on all over again, and that was why she was not completed until 1907 – three years after her closest sister Baltic was. This story has never been confirmed, so the truth still remains a mystery. On April 20th, 1905 the newest addition to the German fleet was launched. She was christened Amerika in the presence of several high German politicians and aristocrats. As soon as the hull hit the water the fitting out could commence. On October 11th, she was completed and set out on her maiden voyage from Hamburg via Dover and Cherbourg to New York. The passengers were delighted with what they were offered. To attract the upper class of the Edwardian era, the Amerika had several astounding new features. 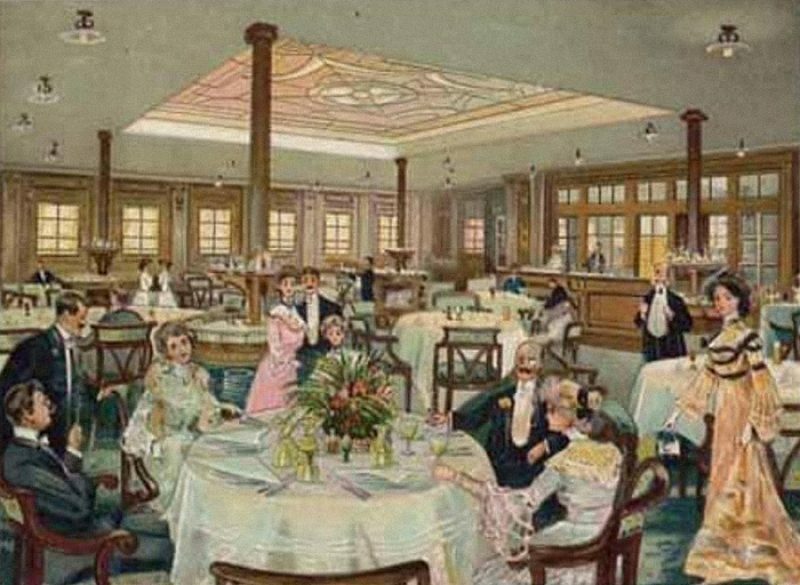 As an alternative to the first class dining room, an à la carte-section had been added. Albert Ballin had hired the two Frenchmen César Ritz (owner and founder of the Ritz) and Charles Mewès (one of the most wanted architects of the time) to supervise the construction of this room to make it resemble the famous Ritz-Carlton Grill at the Carlton Hotel in London. After the maiden voyage, it was realised that this section of the restaurant had been so popular that its kitchen had to be doubled in size. Another prime feature was that of the electrical elevators on board – they were the first ever on board an ocean going vessel. However, the splendour of the Amerika was not only found in her beautiful interiors. Her massive size also gave the public an idea of what kind of ship she was. At 22,225 gross tons she was the second largest ship ever constructed after White Star’s Baltic. 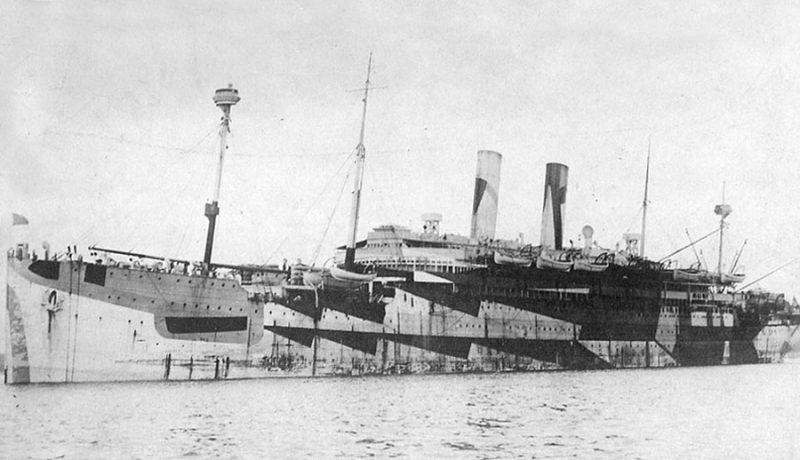 With the arrival of the Amerika’s sistership Kaiserin Auguste Victoria in 1906, HAPAG could for the first time claim to have the largest ship in the world. The Amerika settled into a distinguished North Atlantic career as she plowed the waters time after time. 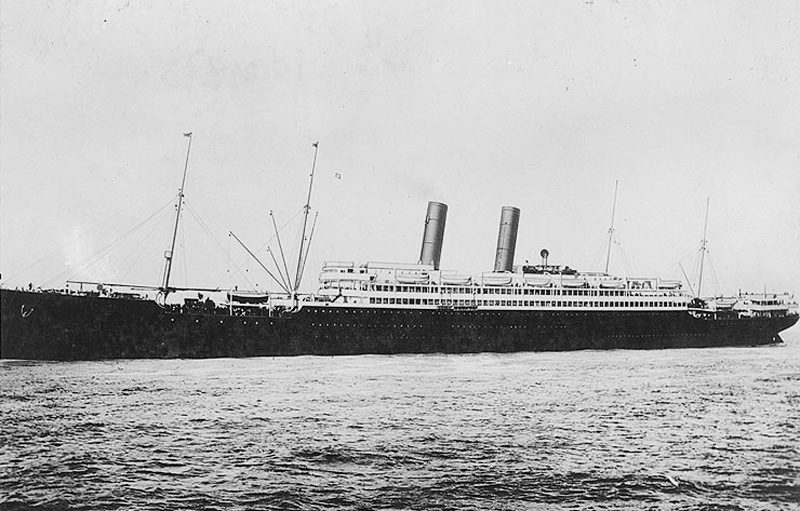 In 1907 she went through a refit which made her emerge with a slightly higher gross tonnage of 22,621, but she was still some 2,000 tons away from being the largest of them all. But even though she was not the largest, she was still feared by smaller ships and other vessels for her sometimes uncontrollable size. On October 4th, 1912 she accidentally rammed and sank the British U-boat B 2 off Dover. The incident cost 15 lives. 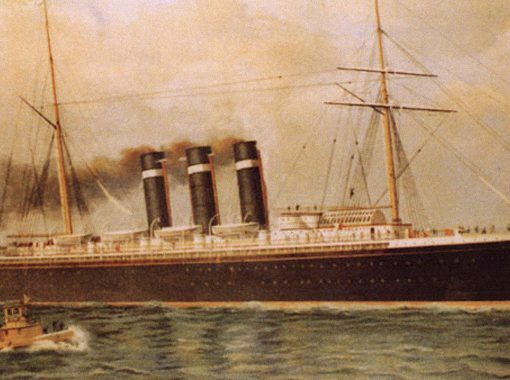 On May 9th, 1914 the Amerika steamed out on her last pre-World War I crossing. She sailed to Boston where she remained laid up until 1917. She was then seized by American authorities and renamed America. The Americans immediately saw the use of her as a troopship and between 1917 and 1919 she completed nine voyages with troops to France. During this period, yet another accident occurred. On July 14th, 1918 she collided with and sank the British Instructor. This unfortunate event demanded 16 souls. Later that same year, she sank at her Hoboken pier after having been refueled. 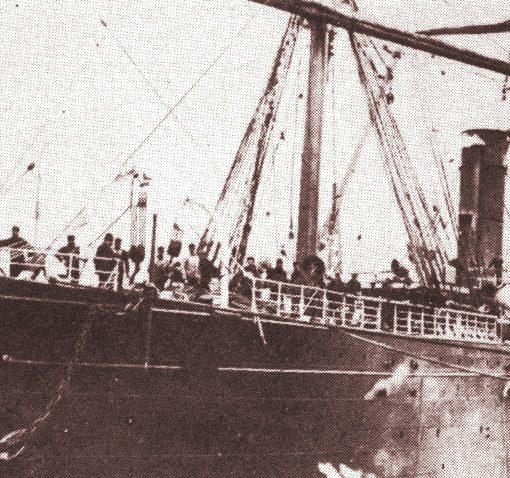 Six people never had a chance to escape the inrushing water, which entered through coaling ports that had been left open in an attempt to air out the spaces below deck that had been disinfected and fumigated. The ship had settled in the mud without keeling over and was refloated later the same month, but was laid up in September 1919 until January 1920. She made some trooping voyages before the US government would let her go. During this period, the America was converted from a coal-burner to an oil-burner. In late 1921, the America was handed over to the United States Lines who kept the military name. 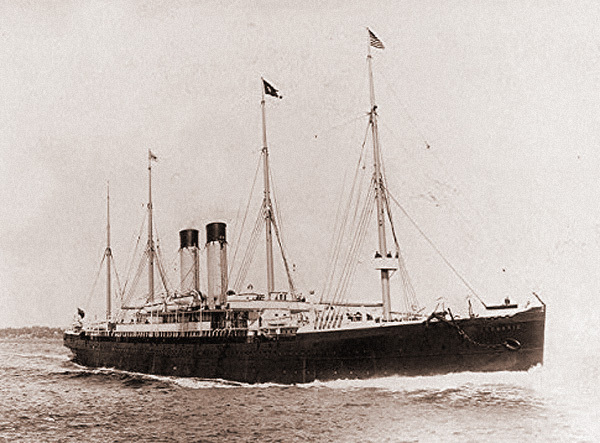 The America and the newly acquired 54,000-ton Leviathan (ex-Vaterland, also a former HAPAG liner) were the largest ships ever operated by the United States Lines to date, but the ships sure brought publicity and popularity to the company. In this guise, the America slowly settled as a ship under a president rather than an emperor. In one of the refits the Americans made to her in March 1926, the America was suddenly gutted by fire at Newport News. A large part of her passenger areas were damaged, to an estimated value of two million dollars. After repairs, the vessel emerged quite different that her original refit had intended her to be. The old class system was gone, and from then on you travelled Cabin, Tourist and Third class on board the America. She resumed service in 1928 and carried on sailing between New York and Hamburg until 1931 when she was laid up in the reserve fleet in Chesapeake Bay together with her old Norddeutscher Lloyd rivals Kaiser Wilhelm II and Kronprinzessin Cecilie. The same year those two greyhounds were scrapped – in 1940 – the America was turned into an army accommodation ship for American soldiers. 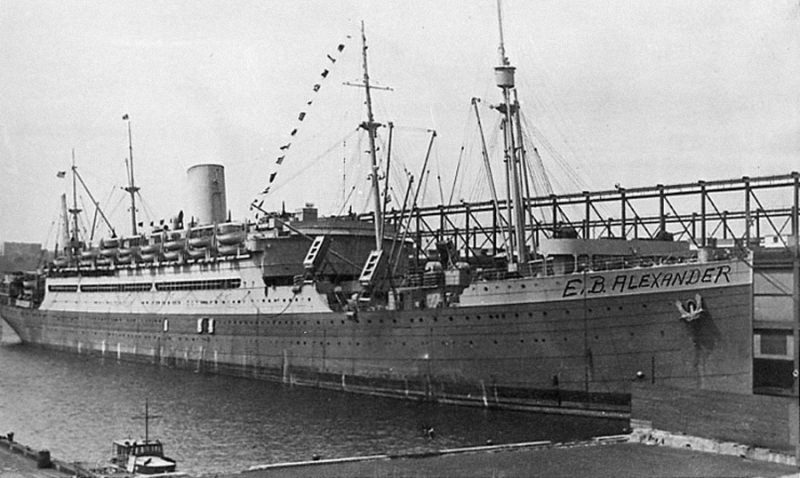 In 1941, the military renamed her Edmund B. Alexander and used her as a troopship between New Orleans and Panama. Her exhausted old engines only provided her with the embarrassing service speed of ten knots. This was bettered in 1943-1943 when the engines were improved by Bethlehem Steel Corporation at Baltimore. The refit also included a removal of one of the two funnels and shortening of the masts. She emerged with an improved service speed of 17 knots and a trooping capacity of 5,000 soldiers. 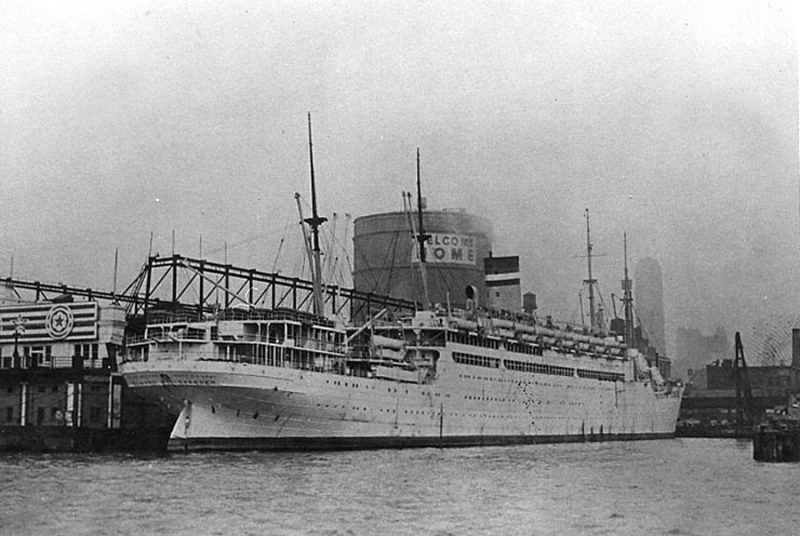 In 1946 she was refitted to accommodate military dependents such as wives and children who were shipped between New York and Europe to their loved ones. 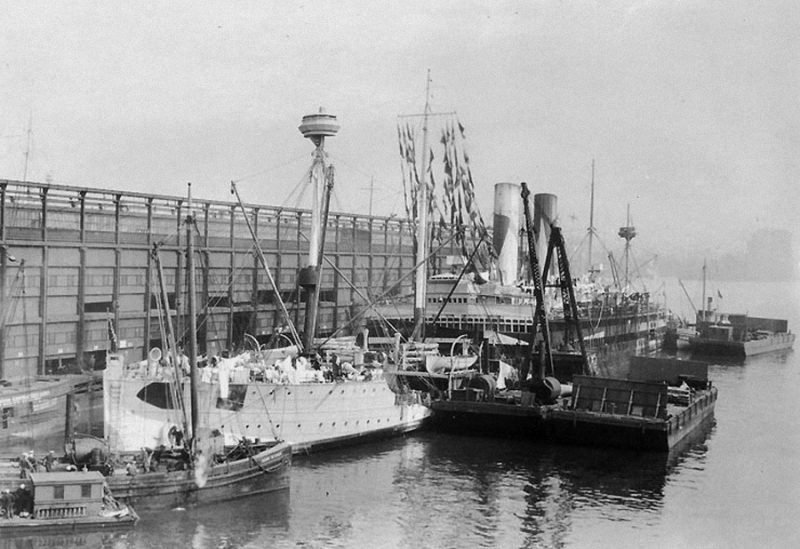 She continued in this service until 1949 when she was laid up at Baltimore. In 1951 she was towed to the Hudson River where she stayed until 1957 when she was considered to be far too old to resume any sort of service. She was sold as scrap to Bethlehem Steel Corporation, towed back to Baltimore and cut up. 1888 – 1923 / Also known as New York / A competitor for the Blue Riband, the City of New York and her sister ship meant a leap forward in ship design, improving on size, speed, and comfort.